My new Oedipan-based theory stems from two events that occurred this past weekend. One, I was in a sporting goods store where I saw those little stress-relief balls. The next ten seconds of squishing that little red ball around in my hand were the best 10-seconds of my day. 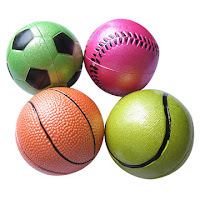 Combine that incident with Friday afternoon when I was visiting my wife at work and saw a little two-year old boy's eyes widen with delight at seeing a large rack of medicine and training balls that he could bounce around. So, here's the thought. Why are men obsessed with spheres? And the concluding thought, is there a correlation between boys who are breastfed and their athletic prowess later in life?